Waheeda Rehman speaks about her life with refreshing honesty, humour and insight. Nasreen Munni Kabir’s ‘Conversations with Waheeda Rehman’ abounds in anecdotes from the iconic life of one of Indian cinema’s most beautiful women actors. Penguin presents the evocative Conversations with Waheeda Rehman By Nasreen Munni Kabir. Renowned for her natural talent and haunting beauty, Waheeda Rehman’s career spans an astonishing array of key films in Indian cinema, including Pyaasa, Abhijan, Mujhe Jeene Do, Guide, Teesri Kasam and Rang De Basanti. 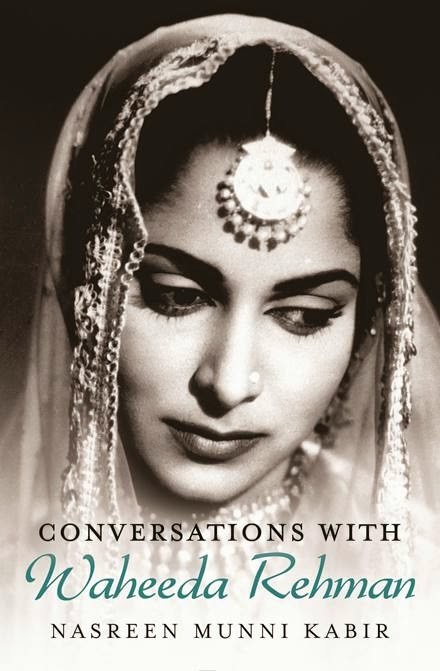 In this engaging book of conversations with Nasreen Munni Kabir, Waheeda Rehman proves to be a lively raconteur, speaking about her life and work with refreshing honesty, humour and insight: from the devastating loss of her parents when she was young to making a life in cinema on her own terms, from insightful accounts of working with extraordinary film practitioners like Guru Dutt, Raj Khosla, Satyajit Ray, Raj Kapoor, Dev Anand and Vijay Anand to her friendship witstars like Nargis and Nanda. A slice of cinema history told through compelling anecdotes and astute observations, Conversations with Waheeda Rehman provides a rare view of a much-adored and award-winning actress of Indian cinema. The Author: Nasreen Munni Kabir is a reputed documentary film-maker and writer on films. Based in London, she has made several programmes on Hindi cinema for Channel 4 TV, UK, including the forty-six-part series Movie Mahal and The Inner/Outer World of Shah Rukh Khan. Her several books are, among others, Guru Dutt: A Life in Cinema, Talking Films and Talking Songs with Javed Akhtar, A.R. Rahman: The Spirit of Music, Lata Mangeshkar: In Her Own Voice and, most recently, In the Company of a Poet, a book of conversations with Gulzar.